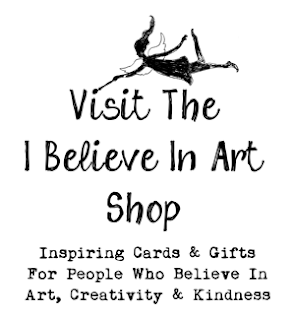 If you follow I Believe In Art on Facebook or Instagram you may have seen some evidence that I was struggling with keeping my art studio tidy lately. 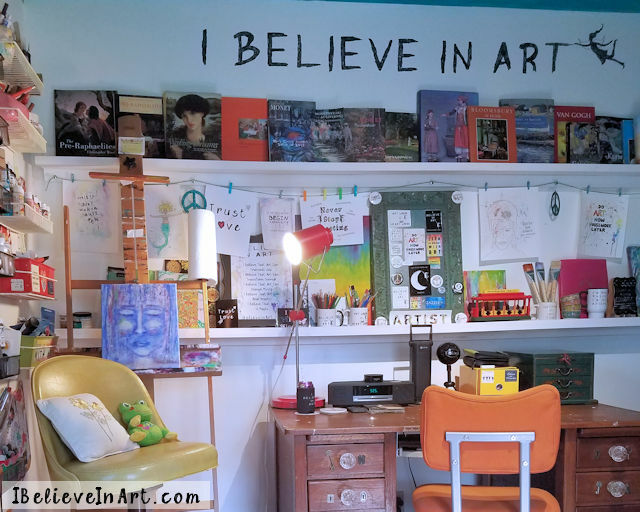 The truth is that clutter in my art studio (and other places in my home) has always been a struggle for me. Honestly, for the past few months I've mostly just accepted it and lived with it because I was busy tending my gardens but now that the dog days of summer are here I've been spending more time indoors and finally I decided I just couldn't take it anymore. 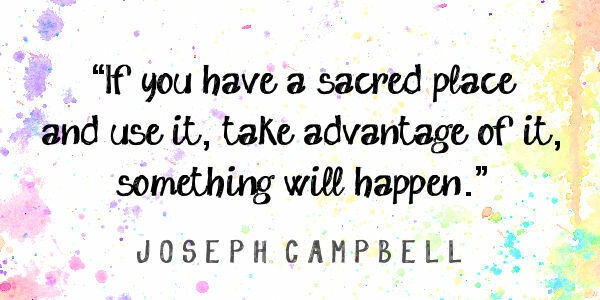 If you have a sacred place and use it, take advantage of it, something will happen. I remembered I also wrote that quote on my chalkboard wall above my sink when I first finished remodeling my art studio back in 2014. I'd wanted it there to remind me how fortunate I am to have my “sacred place” and of all the magical things that happen when I truly take advantage of it. Now, three years later, I realized that I had forgotten that, not completely but enough that I wasn't honoring my sacred place like I should. So I got up and wrote that quote on my chalkboard wall again and then got back to work with a new clarity and renewed energy. It was kind of amazing how easy it was to make decisions about the clutter in my studio after that. When “sacred” is your standard, there is a lot that isn't going to make the cut! 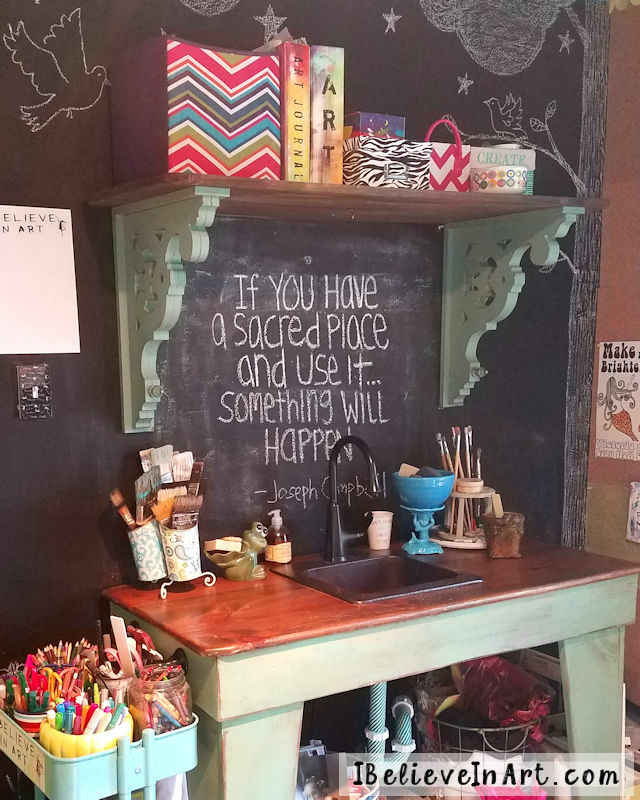 And yet at the same time I found myself letting go of the need to make things perfect because I don't think sacred has very much to do with how “pinterest worthy” your creative space is. I think sacred is more about feeling purposeful and peaceful when you are in that space. For me that means having the tools I use the most in reach and being surrounded by what inspires me. So I'm happy to say that my sacred place is back in resplendent working order and that I have indeed been using it and yes, magical things are happening. I'd love to hear about your sacred place or any thoughts you have about this post in the comments below. What a spot on post! I love the quote you shared here and it's going up in my studio right after I get done commenting. Seeing my space as sacred does make a difference about what thoughts and things I allow in. It also calls me back more often because, after all, who doesn't want to spend more time in a place that is so special. Hi Aprille! Thanks so much for reading. I'm glad you were able to take away some value from my journey and I so appreciate your letting me know. Enjoy your sacred place. Perfect philosophy. 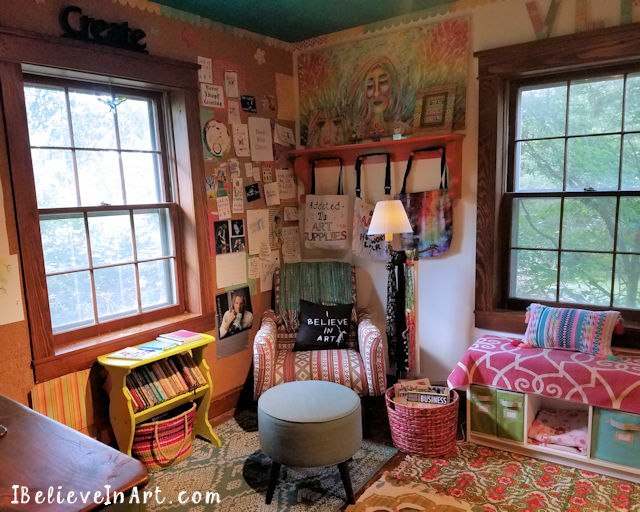 There are so many fabulous but perhaps staged studios online that the real deal paint spattered, fabric littered, glitter scattered, and ink soaked spaces don't seem to measure up. But they do. And they measure even farther ... because that's where inspiration lives and art gets made. Thank you - great perspective. Thanks so much for your encouraging comment, Pam. Nothing makes me happier than a good paint splatter. :) Happy creating to you!